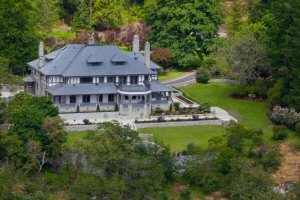 Rosehill has a presence in the multi-million $ restoration to this lovely early 20th century estate on Vancouver Island, just outside of Victoria on Saanich Inlet. Abstract Developments, with whom we have done a number of wine cellars in customary new home builds, had an irregularly-shaped room, 2-ft thick original stone walls. There were also very low ceiling to deal with in this restoration. We eventually agreed on an ONAM CW30W wine cellar cooling unit and a number of 6.1 Classic kit wooden wine racks. This 2010 restoration property was finally on the market with an asking of $8.9M.